The day started with a fun early morning drive up forest service road 361 to reach the upper trailhead in Yankee Boy Basin. I drove as far as permitted–the road was closed about 1/2 mile below the upper trailhead. The hike to the summit was short in mileage, but was the most difficult technical hike that I have done. The steepness of the first gulch combined with loose rock required some concentration. The second gulch (Lavender Couloir) still had some snow, but my Kahtoola microspikes provided enough traction to get through safely. Finally, the “V” notch at the top of Lavender Col required a little courage to pull myself up and through it. 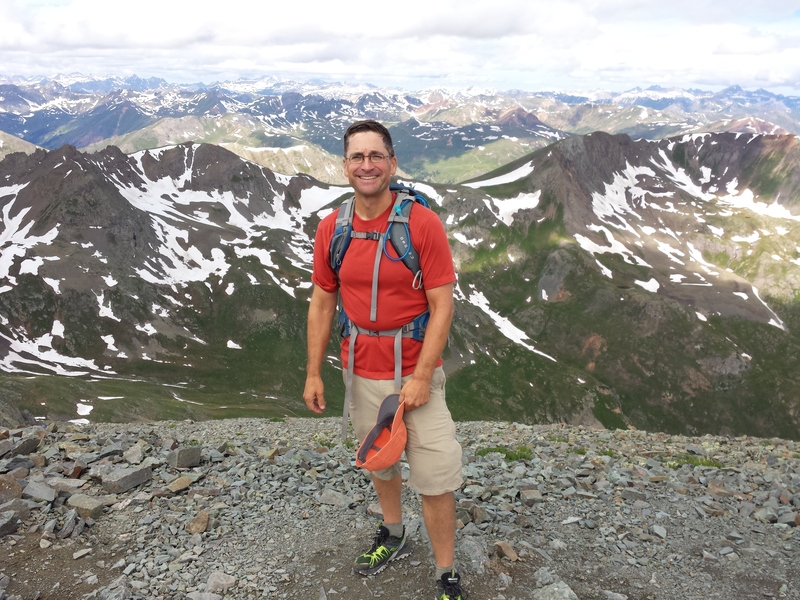 This was my 8th fourteener summit. I took my time going up and down, being especially careful in the snow. On the way down I met with some groups who were on their way up. I spent some time chatting with the others about the trail conditions. I lent my microspikes to some of them, to help them navigate the snow. I dedicated this hike to my Dad, and meditated on his memories and his presence throughout. I also remembered previous visits to Yankee Boy Basin and Blue Lakes with Michelle and our old dog Sarah Jane. This day started with a 4 AM departure from my campground at Ridgway State Park, in order to reach the trailhead at a reasonable time. The drive included a section of the Alpine Loop 4WD road, Cinnamon Pass, and American Basin. 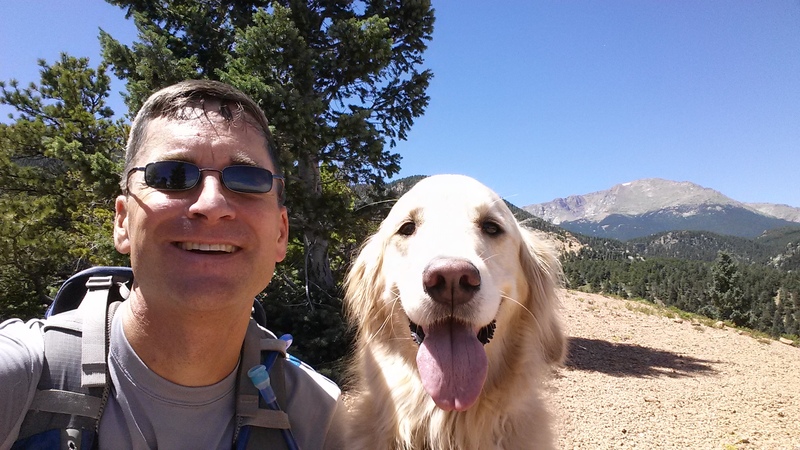 Handies Peak was my 7th fourteener summit. The standard route through American Basin was pleasant, with abundant wildflowers, waterfalls, and marmots. 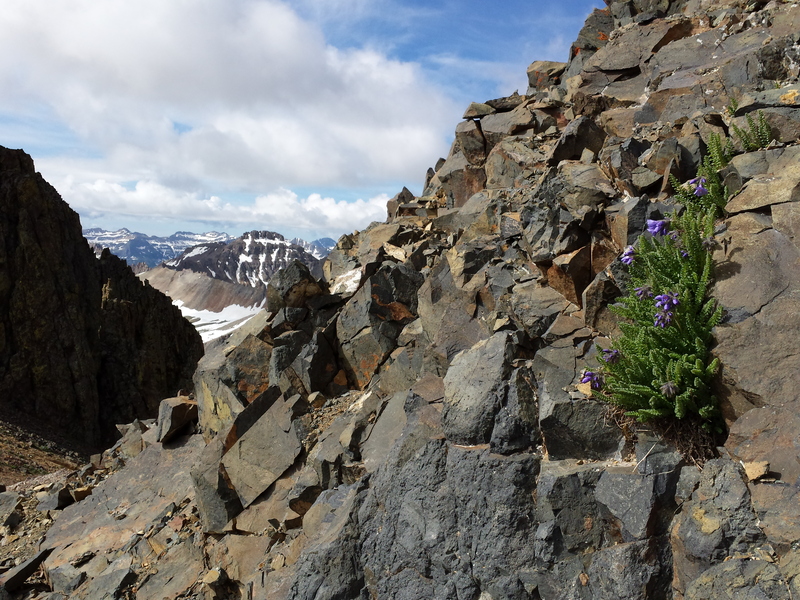 From the summit, views of the surrounding San Juan mountains were just great. My goal for this hike was to locate a trail that I was not able to find on last year’s Cameron Cone hike. I did figure out where I made the wrong turn last summer. It feels good to close that gap in my knowledge of local trails. Although, Cameron Cone continues to be a challenging and enigmatic peak. It is so close to Colorado Springs, yet very difficult to access. Today’s route started in Manitou Springs. I had to park down in Manitou because the Barr Trail lot was full. 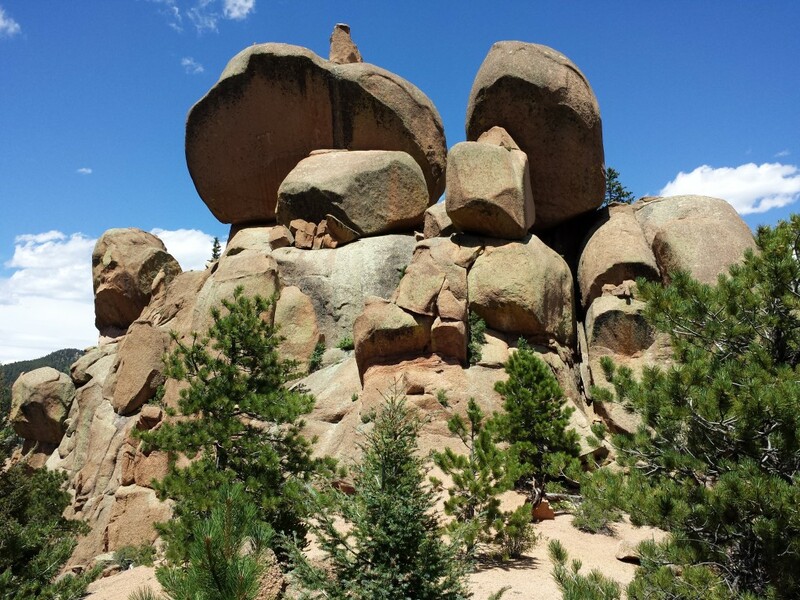 We hiked up Ruxton Avenue, and then Barr Trail to the Englemann Canyon turnoff. We crossed Ruxton Creek and the cog tracks, and found the unnamed trail leading out of Englemann Canyon. The crossing and trail-finding is a little confusing. I’m not confident that I used the optimal route here, but I did find the trail. The unnamed trail in Englemann Canyon is a mystery–it’s in good condition for an unofficial trail. The trail has steep switchbacks that climb up Shady Spring Gulch out of Englemann Canyon. The last chance to replenish water is at the creek crossing in Shady Spring Gulch. At the top of the switchbacks, there is a short section of class 2 scrambling to get around Magog rock. About 1/8 mile later the trail routes around the east side of Gog rock. From Gog rock, a dirt road leads to a Forest Service boundary sign and junction with a double-track trail leading up towards Cameron Cone. Note, my copy of the Pikes Peak Atlas (9th edition) shows this short stretch as a single-track trail. 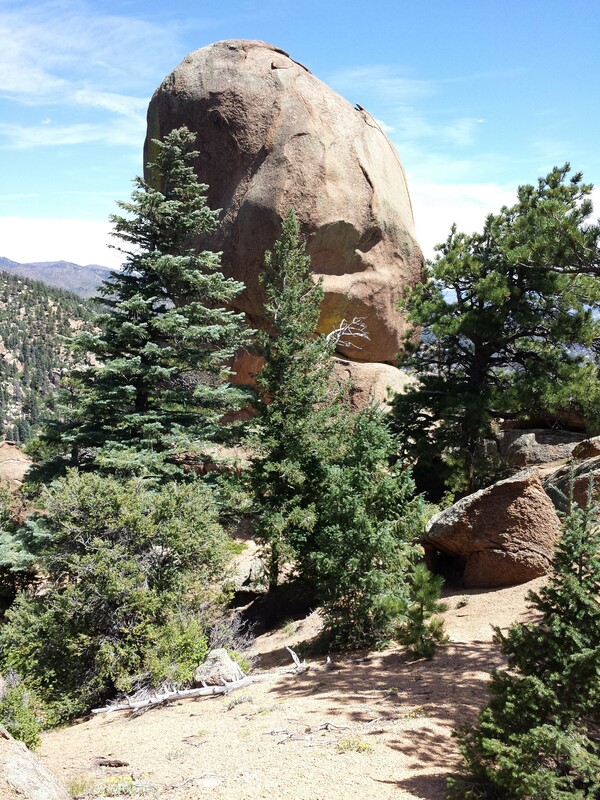 Now that I’ve been up there, I can pick out Gog and Magog rocks from certain vantage points in Manitou Springs. Like Cameron Cone, they seem so close, but are difficult to reach.